This is a recycled campaign that returns regularly but we approve of it simply because it places the responsibility on the motorists. No ignoring the bull in society's china shop here. "Catch the cyclist with your eyes - not your door" is what it says. These car doors are on posts in various locations. This one was captured by Sandra from the brilliant Classic Copenhagen blog. Sure, people get doored anywhere there are cars and that includes Copenhagen. I know a few people who have experienced it by I personally have been lucky to never have been even close to it in 17 years in Copenhagen. Motorists know to watch for cyclists, to expect them. I know that in the few times I've been in a car with my kids (my kids spend about five hours in a car each year), you always find yourself saying "watch for bikes" when they're getting out. It's a mantra that every kid hears. When getting out of cars, crossing the street, at bus stops, you name it. 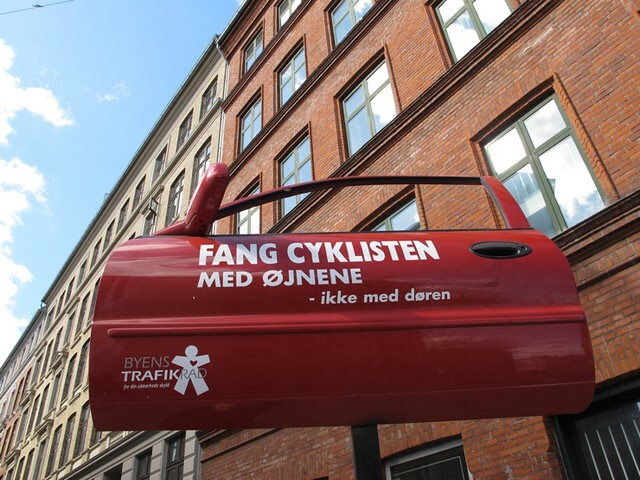 Ironically, this campaign is from Byens Trafikråd - The City's Traffic Council - and it one of the very, very few campaigns from their hand that is actually rational and doesn't point fingers at cyclists.